six in the main building, four in Myra's Retreat, and one in the secluded Wren's Nest. Each room displays art carefully chosen from the Blue Dome Gallery to complement its unique personality. The 1928 Lodge building houses the spacious common area with its remarkable fireplaces and hand-hewn beams and staircase, as well as the art gallery, dining room, and gift shop. The building is surrounded by expansive shaded portales and landscaped with drought adapted plants. Public areas and all eleven guest rooms display original works of art provided by the Blue Dome Gallery. On the ground floor of the main building are the Gila and Mimbres rooms, named for local rivers. 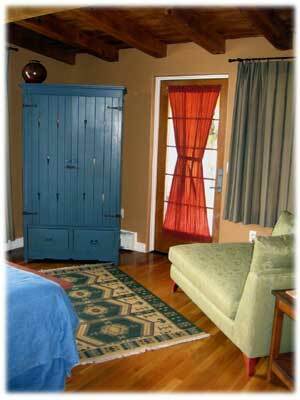 Both rooms offer king-sized beds and outdoor porches. The Mimbres is ADA accessible, with separate shower and tub. All our guest quarters feature roomy, fully modern bathrooms with 1920s style ceramic tile. Upstairs are four deluxe rooms with private balconies, locally hand-crafted queen or king beds, and full-size sofa beds. The rooms honor individuals prominent in the history of New Mexico - Georgia O'Keeffe, Aldo Leopold, Cabeza de Vaca, and Lt. Col. William Emory. Both the O'Keeffe and Leopold rooms have Jacuzzi tubs. Wifi is available throughout the Main Lodge. A few yards from the main lodge building sits Myra's Retreat, named for a long time owner of Bear Mountain Lodge. Here you will find four private guest rooms surrounding a large common area with comfortable seating and a gas fireplace. Each room features a locally handcrafted pine bed, two in Warbler. The rooms are named for common New Mexico birds - Roadrunner, Bluebird, Warbler, and Hummingbird. Myra's Retreat is the perfect spot for group gatherings and family reunions - wifi is available. This spacious getaway is perfect for larger families with its queen and full beds. The Wren's Nest and Myra's Retreat are dog-friendly. No wifi, but the main lodge has wonderful places, both in the great room and the dining room, to use its wifi. next to Blue Dome Gallery in Downtown, in the midst of the Arts & Culture District, strolling distance to art galleries, restaurants. Ursa Minor has 1200 sq.ft, king bed, double sofa bed in living room, 400 sq.ft bathroom. Two-day minimum, housekeeping service, breakfast at The Main Lodge. Pet-friendly. 60 Bear Mountain Ranch Rd. San Road, left onto Bear Mountain Ranch Rd. Some GPS directions are inaccurate.